Highlands Stud part of Ridgemont’s four times Equus Outstanding Stallion Dynasty had another day to remember at Greyville last Saturday. 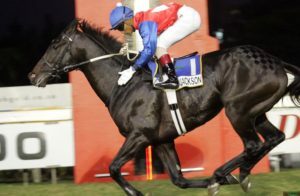 The 2003 Vodacom Durban July winner and 2002-2003 Horse Of The Year was responsible for Saturday’s impressive G3 DStv Gold Vase winner It’s My Turn as well as July second Made To Conquer. The latter, a controversial exclusion from the July itself, pushed his earnings to over R2 000 000 when landing the R500 000 Gold Vase for Dynasty’s former trainer Dean Kannemeyer and record breaking July winning rider Anton Marcus. 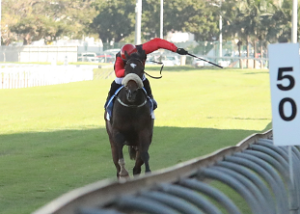 Bred by Willem Englebrecht Jr, It’s My Turn (one of four Investec Cape Derby winners for Dynasty) had captured the G3 Track And Ball Derby at his most recent outing and has now a trio of graded victories to his name. Out of the mare Jallad’s Queen, and a R400 000 buy from the 2014 Emperors Palace National Yearling Sale, It’s My Turn is bred on the increasingly successful Dynasty/Jallad cross –also responsible for this season’s G1 winners Eyes Wide Open and Liege, as well as the unbeaten Flamboyant Stakes winner Hashtagyolo. Another son of the great sire, Made To Conquer, went close to emulating Dynasty himself when a close second in Saturday’s G1 Vodacom Durban July, beaten only 1.25 lengths by stable mate Do It Again. A winner of six of just 11 outings, Made To Conquer became a millionaire with his runner up finish in Saturday’s G1 contest. Bred by Michael De Broglio, Made To Conquer (who is closely inbred to Sadler’s Wells) had captured the G3 Lonsdale Stirrup Cup at his most recent outing. Dynasty has had another magnificent season in 2017-2018, with his runners capturing such races as the G1 Sansui Summer Cup, G1 Investec Cape Derby, G2 Glorious Goodwood Peninsula Handicap, G2 Heineken Cape Stayers, G2 G3 Track And Ball Derby, G2 Southern Cross Stakes, G2 Gerald Rosenberg Stakes, G3 Umzimkhulu Stakes, G3 Chairman’s Cup G3 DStv Gold Vase, G3 Cup Trial, G3 Gold Bowl, and G3 Lonsdale Stirrup Cup. His triple G1 winning son Jackson, yet another Cape Derby winner for Dynasty, has made a very bright start with his first 2yos this season, and was responsible for Can You Feel –a close third in Saturday’s G2 Samsung Golden Slipper. From the same family as US champion sire Smart Strike, Jackson will be represented by Mr Crumford in Saturday’s Listed Highlands Stud Langerman.